To provide the female timeless mesmerizing beauty, we at Sunlord Apparels unfurl an exclusive collection of womens jewelry. Symbolizing India's rich art and culture, our jewelry items are beautified with tear drop, strawberry, round & tube shaped beads of diverse eye catching colors & sizes. 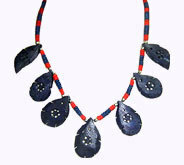 Floral, leaf & chain designs further embellish them. Made to last for ages, our collection includes fashion beaded necklace, ladies beaded necklace, ladies fashion necklace and many more. Desc : Appropriate to deliver women's neck fascinating look. 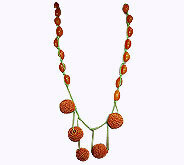 Strawberry shaped beads have been appealingly strung and hung with green string of these fashion beaded necklaces. 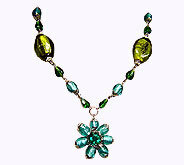 Desc : Olive & blue colored multi sized glass beads are gracefully strung in this beaded fashion jewelry. Flower shaped pendant looks magnificent on every type of apparel. 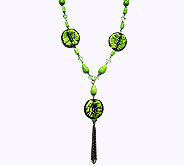 Desc : Tiny & medium sized green beads improve the glamor of these ladies beaded necklaces. 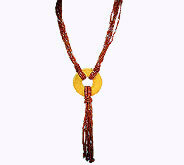 Enchanting beaded pendant & fringes further beautify them. Desc : Redefining the style and beauty innovatively, multi strand necklaces having maroon small beads are must for the jewelry box of jewelry lover women. Desc : Shining example of Indian artistry. 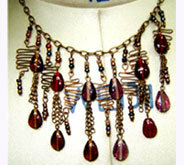 Ladies fashion necklaces possess tiny & tear drop maroon beads, which are elegantly suspended with strong & stylish chains. 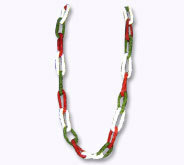 Desc : Red, green & white colored links make these women's chain necklaces a fetching jewelry item. These light weighted necklaces can be worn comfortably. Desc : An easy & striking way to look fashionable in every function. 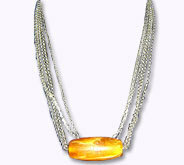 Orange colored tube bead is charmingly strung in the multiple chains of these exquisite beaded fashion necklaces. Desc : Tear drop shaped blue beads & tube shaped red& blue beads have been placed in these women's beaded necklaces to rule the world of fashion with innovative creations.